A compost pile is literally what it sounds like: a pile of compost in your yard to use as rich, fertile soil for your garden. 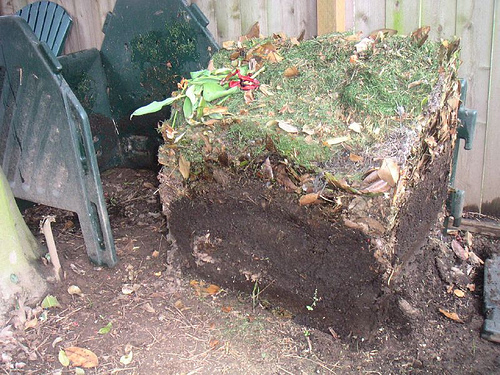 Of course, a compost pile doesn’t just “happen” – you have to build one. Do not fret, for it is a simple process. By following certain guidelines, you can ensure that you have a proper compost pile in our lawn. You want the area that you are creating the compost pile on to be able to touch the ground. Placing your compost pile on wood for instance can cause the wood to decay. Try to avoid the compost pile touching any buildings. In addition, you want the surface area of which the compost pile is to be placed on to be level, and with good drainage. Make sure the compost pile is in a convenient location, so you can access it with ease. You want the size of your compost pile to have the same dimensions throughout. Ideal sizes for your compost pile will range from 3x3x3 to 5x5x5. Now that you’ve got location and size settled upon, now what? So, now you’ve selected your location and you are aware of what size you want your compost pile to be. Next comes the construction of the compost pile. The most important thing you can do when creating your pile is to layer your materials. A good compost pile has an equal balance of Nitrogen rich materials (fruit peelings, vegetable trimmings, etc) and Carbon rich materials (sawdust, newspaper strips, leaves, etc). The easiest way to maintain this balance and to have your compost pile work efficiently is to alternate layers between Nitrogen and Carbon rich materials. You want to start with Nitrogen rich materials closer to the ground. This will also help keep animals and pests away from the compost pile. Carbon Rich MaterialJust repeat the layers on top of one another and you should be good. You can also cover these two layers with an additional layer of compost starter and soil. If this is the case that is fine, but then make sure you repeat the cycle if you are adding new layers to your compost pile. In addition, you may cover your compost pile if you so desire, however this is not necessary and will certainly not make or break a good compost pile. The purpose of doing so is to help reduce drying of the organic material and to keep the compost pile moist. In addition, it may help retain heat for the compost pile – a hotter pile will decompose quickly and efficiently. Don’t forget to make sure that compost piles are allowed in your city. If not, use a compost bin instead.